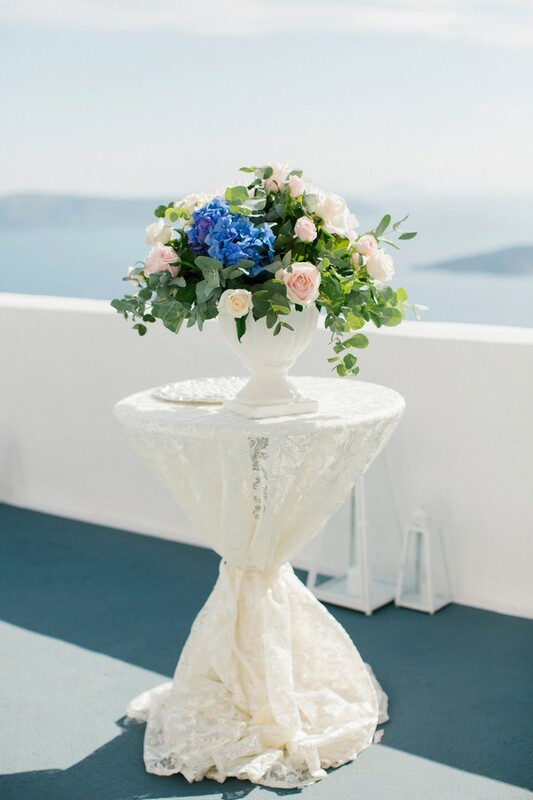 Santorini Greece Wedding at Kamares Apartments. 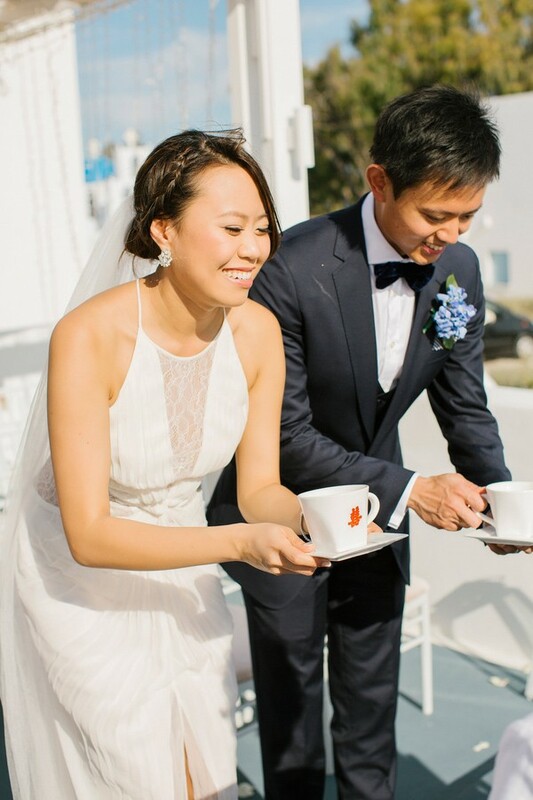 Wei and Marissa live in Perth, Australia, and after falling in love and getting engaged, the two started planning their wedding. They soon got distracted by honeymoon ideas and when Marissa proposed a destination wedding in Santorini, Greece, Wei confidently said Let's do it! After planning a half a world away, the two enjoyed a beautiful sunlit ceremony and reception right on the edge of the caldera cliff. The couple wanted their wedding to feel laidback and natural. 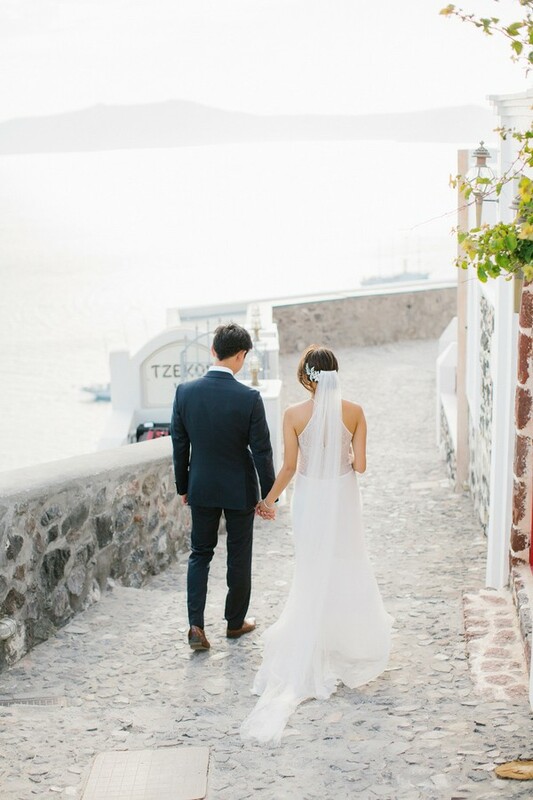 Embracing the culture, many elements of their Santorini Greece wedding leaned on the blue and white architecture and the gray and black natural surroundings. The entire day projected a clean and seamless appearance. Marissa wore a stunning high-neck dress with ruching and lace panels. 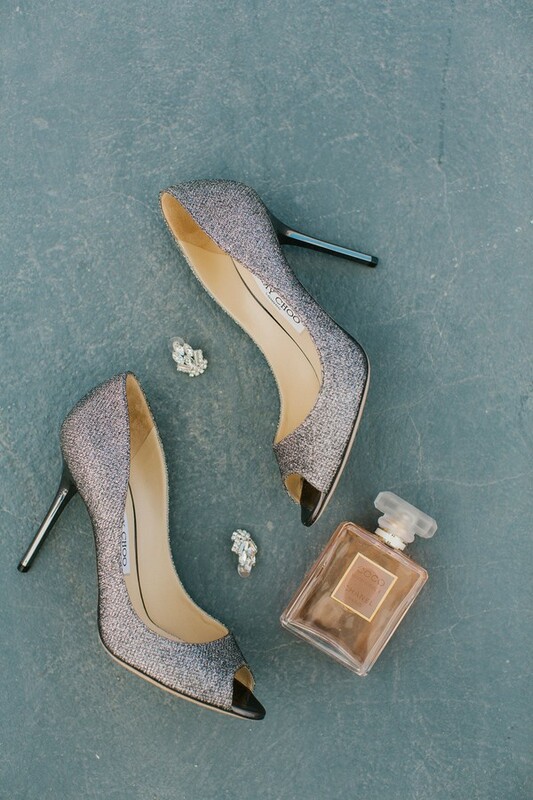 She accessorized with a veil, silver beaded earrings, and a gorgeous pair of silver Jimmy Choo peep-toe heels. 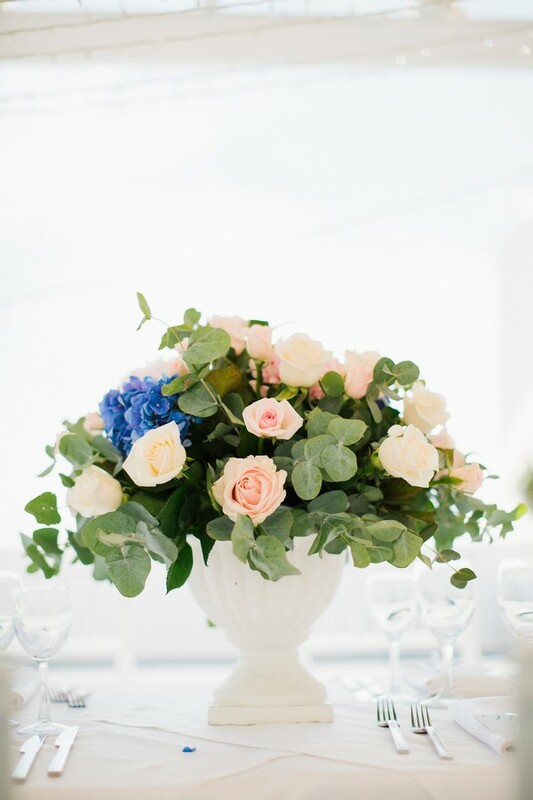 The flowers for Marissa and Wei's big day featured pink, blue and white blooms. Marissa's bouquet was a beautiful collection of blue hydrangea, pink roses, and a pink peony. Wei looked handsome in a dark three-piece suit complete with a black bowtie and brown shoes. 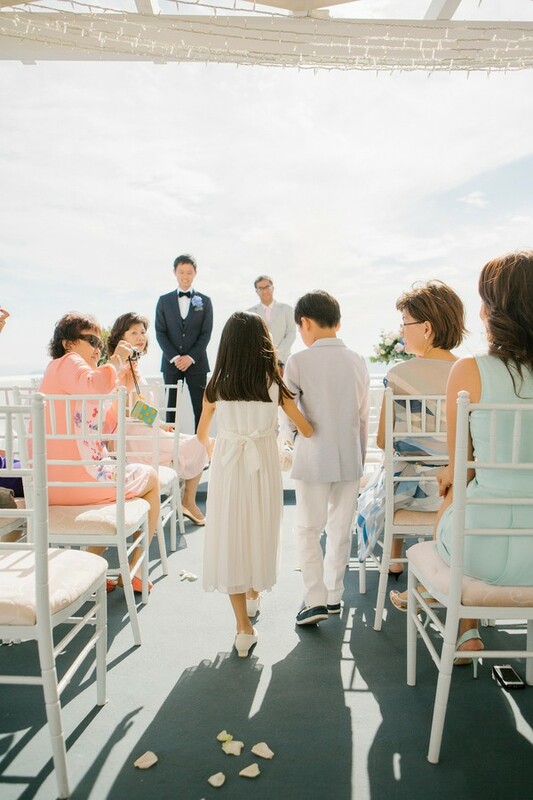 A flower girl dressed in a sparkling white dress and headband, and a ring bearer in a light blue jacket, pink shirt, white pants, and boat shoes rounded out the bridal party. 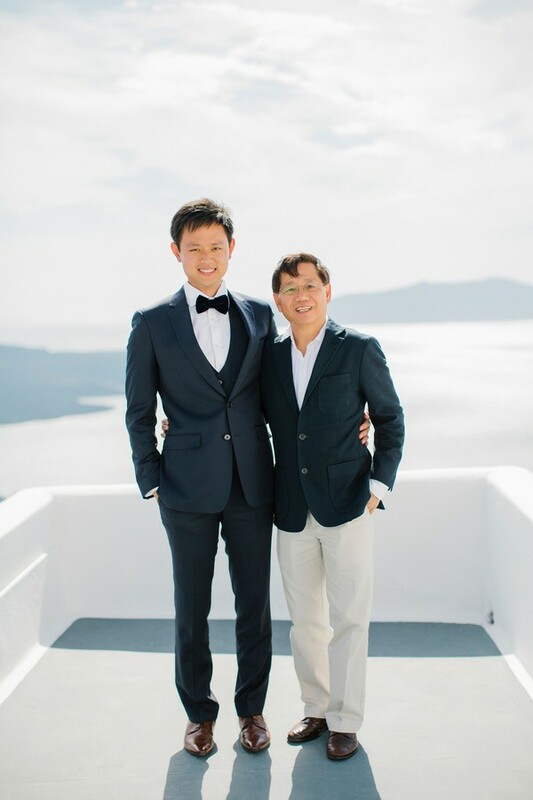 A large terrace overlooking the caldera cliff and all of Santorini served as the location for the ceremony and reception. 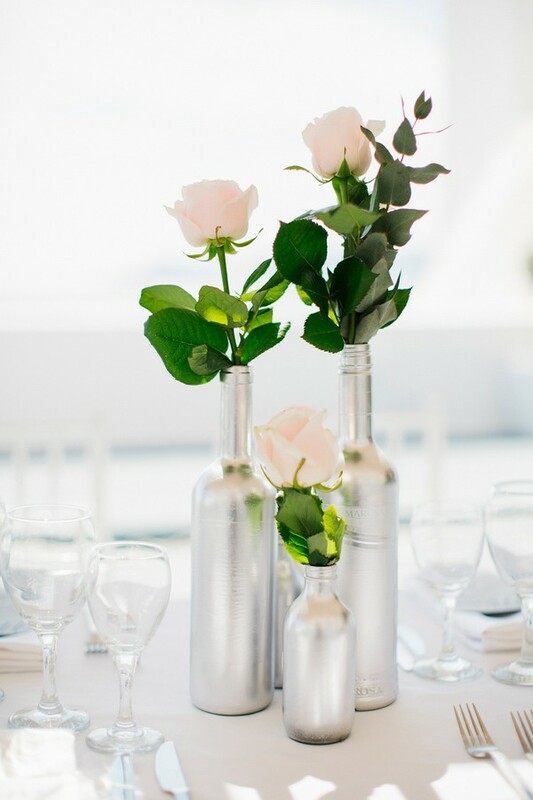 The tables were dressed with silver bottles filled with flowers of white, blue and pink. String lights, white table linens and white chivari chairs rounded out the bright and immaculate scene. The ceremony space featured just enough white chairs to flank the aisle leading to the edge of the terrace. A lace-covered table with a beautiful flower arrangement and white lanterns added additional elegance to the space. The couple said I do in front of an intimate gathering of loved ones and afterwards, they participated in a traditional Tea Ceremony. They made their way down outside of the villa to take a few private photos together near the black volcanic cliffs of Santorini. They strolled hand-in-hand and paused in various spots to take in the setting. They stood like the stunning pair that they are next to the white buildings and overlooks. They joined their guests for a dinner complete with traditional Greek cuisine. The lace-covered table was transformed into a cake table later in the evening. A two-tier cake with white ruffled fondant was decorated with a bell of blue hydrangea and pink peony. As the sun set on Santorini, the sky turned into a marvelous splash of pink, yellow and blue. Marissa and Wei enjoyed their first dance together on the terrace as they enjoyed the last breath of sunlight on their special day. 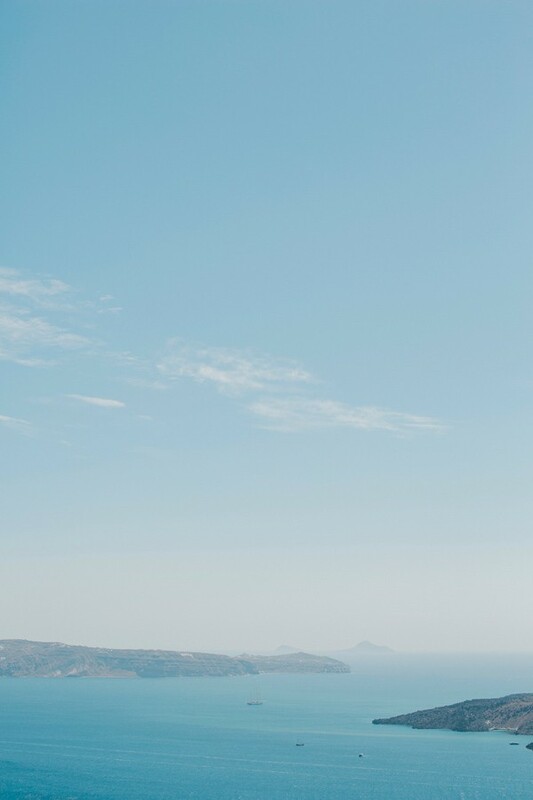 After their wedding day, they chose to take an additional portrait session while still in Santorini. They wore their traditional wedding garb and also, changed into fun looks, as well. 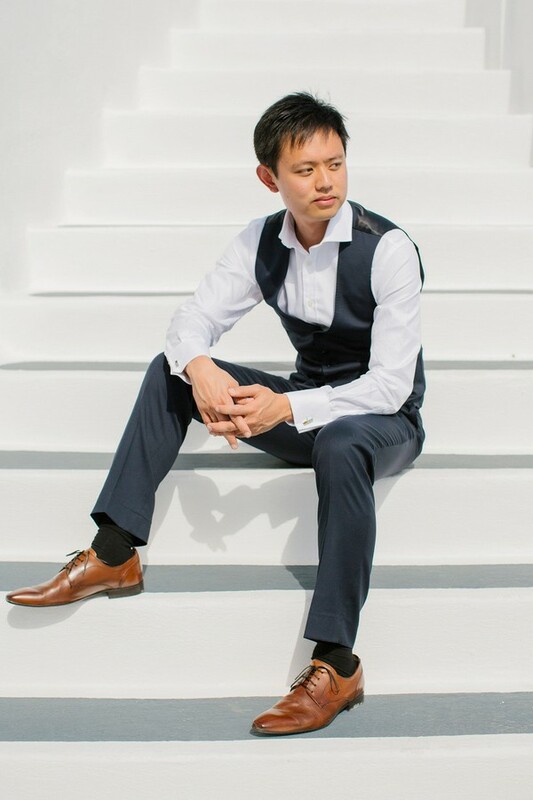 Admiring the sharp cliffs and rocky beaches, Marissa wore a short lace dress with a high neckline while Wei looked chic in a light jacket, blue pocket square, and blue pants. Even though their wedding location was a spur of the moment decision, Wei and Marissa had a clear vision from the start about what that day had to reflect. Their laidback attitudes and zest for life was at the forefront of their bright and shining day. 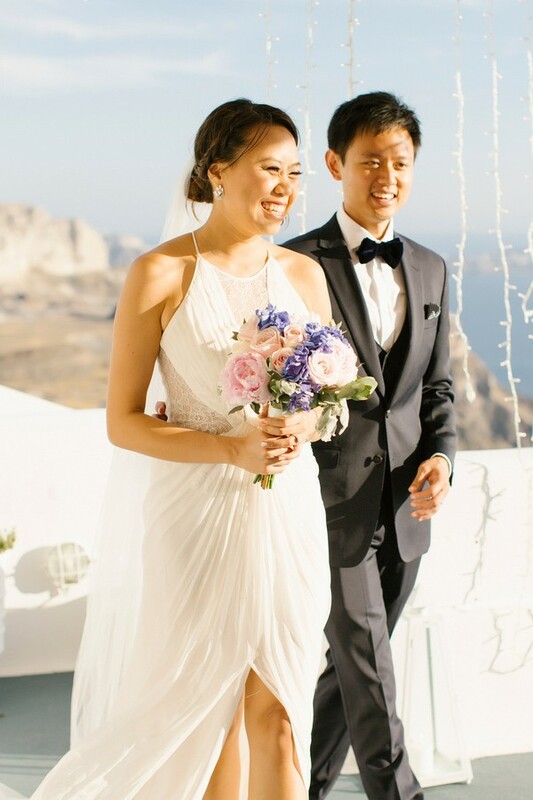 Santorini was a sunny and spectacular dream of a location that Wei and Marissa will never forget.